1. 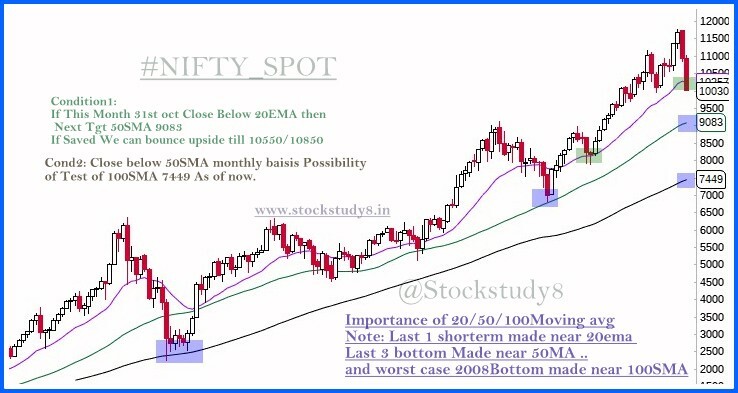 Last Bottom Dec2016 around Notebandi News we made bottom near 20EMA Monthly.. Again we trading below this level.. and we have 3 trading days left of Monthly close.. if we able to hold this level 10256 on 31st Oct then we see sharp rally towards 10550/10850. 2.If we Close below 20EMA Monthly then Next Support around 50SMA 9083(it can also change later ) because its dynamic support. 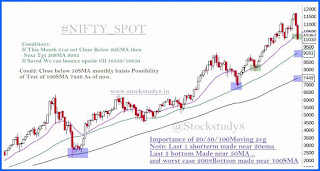 3.What is Importance of 50SMA in indian stockmarket..last 3 bottom in year 2011,2013 and feb 2016 we made bottom near 50SMA so again possibliy of making bottom is high..
4.Worst case if We close below 50SMA too then next 100SMA thats around 7500 today. 5.In 2008 and 2004 we made bottom near 100SMA so last wort case we can post probably bottom there. Remember an important point folks. NO ONE CAN TELL THE FUTURE. What we are trying to do here, with Technical Analysis, is to provide ourselves with a framework to base our trades upon. Also Read My Goldern Rule To Survive Bear market.